It is the most convenient way to access the official audio guides that will put at your disposal numerous museums, monuments, interpretation centers, municipalities and cities. You will also enjoy the specialized audio guides that hotels and other companies in the sector will put at your disposal: city tours, restoration routes, leisure and shopping, routes of experiences, etc. On your own mobile device, without having to queue to pick up the old audio guides. Offline mode, without data consumption, once downloaded. You can listen to the audio with your own headphones, the speakers of your mobile device or as if it were a phone call. The application is translated into 5 languages ​​and you will have the possibility to listen to the audio guide in several languages ​​when it is so designed. The detection of the language is done automatically. Find other nearby centers that also have their audio guides with us. Orient yourself in the city audio guides thanks to the built-in map: locate the main monuments, museums and points of interest and use the recommended routes to cross them. Take the audio guide with you wherever you go and listen to it as many times as you want. You can download the audio guide remotely using some free Wi-Fi (for example your hotel) or in the center with your mobile data (if it does not have Wi-Fi available): do not worry, the tracks are compressed in such a way that the consumption in data and the space they occupy in your device is minimal. You can erase the audioguides whenever you want, and even erase only the audio tracks, leaving the name of the audio guide in case you ever want to download it again. 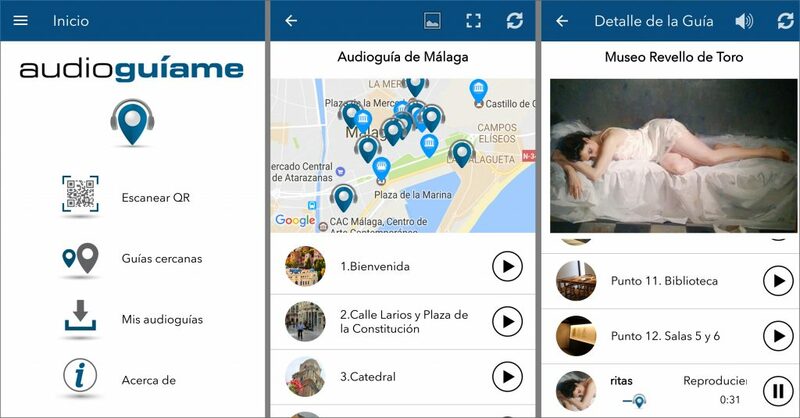 Using Audioguíame app for a guided tour is a simple, comfortable and rewarding experience. You only need to scan the QR code that will be available to download the audios … and enjoy! Audioguíame will help you to better understand the content and the context, just as if a guide were with you, but with the advantages of being able to mark the times to your liking, making the breaks that you consider appropriate and retaking the explanation whenever you wish. Download now Audioguide app and start enjoying, it’s completely free!